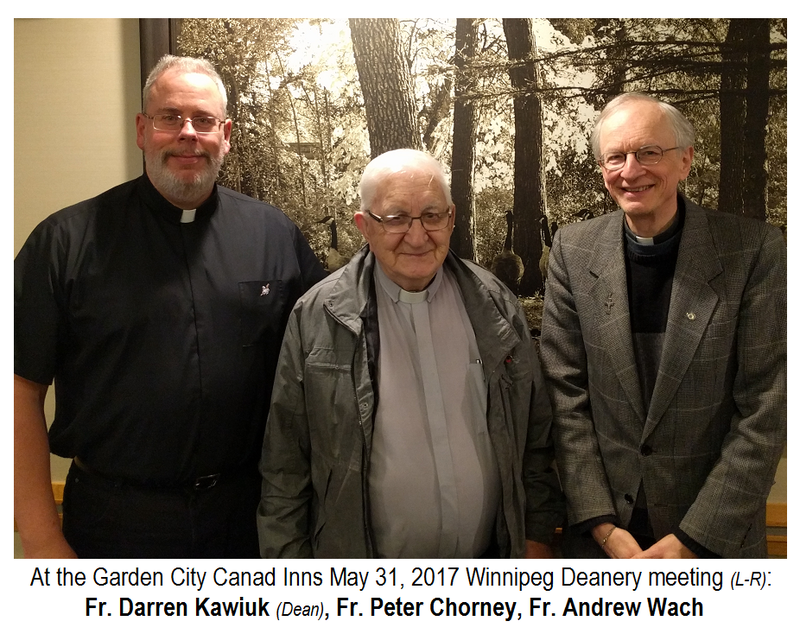 The clergy of the newly expanded Winnipeg Deanery convened on the last day of May for a Wednesday midday meeting. The meeting was held in a conference room off the Aalto’s restaurant at the Garden City Canad Inns hotel on McPhillips street in Winnipeg’s north end. When the Archbishop of Winnipeg, Metropolitan Lawrence, amalgamated two of the deaneries (Beausejour and Winnipeg) into one he appointed Fr. Darren Kawiuk, STL as the first Protopresbyter (i.e. Dean) of the now enlarged Winnipeg Deanery. Fr. Darren also serves as parish priest of Sts. Peter and Paul Parish in St. Boniface and as Protosyncellus (i.e. vicar general) of the Archeparchy of Winnipeg. Fr. Darren hosted and chaired the meeting of clergy to which were invited the priests as well as deacons that serve the area and representatives of the religious orders – Basilians and Redemptorists – that serve parishes in the city. It was a welcome occasion for brother clergy to get together to talk about the pastoral needs of their parishes as well as updating each other as to “where they’re at” on a more personal level. Much of the discussion focused on the spiritual and pastoral wellbeing of the parishioners and the clergy that serve them. Most of the clergy that represent some 49 parishes in all were able to be present, although local pastoral duties forced some to send in regrets. Among the many things that the agenda tried to tackle and coordinate were more effective hospital visits; marriage preparation programs; summer Liturgy schedules and even pastoral substitution when clergy will also need to take a break this summer and autumn. The better sharing of parish gifts and resources was also touched upon. A lot of interest was shown about the joining of Catechism programs so that duplication would be avoided where possible and resources could be concentrated on better quality materials, additional teacher training and facilities. Many agreed that a centralized program, for example - at a school facility on a Saturday (similar to what the Cathedral parish now runs in Ukrainian) would probably work very well. The clergy discussed many other subjects like the progress of the Mission Days 2017 program, the need to promote vocations, the encouragement of Seminarians and all those contemplating a vocation to the consecrated life. A number of practical administrative and financial matters were also covered. The Archeparchial Syncellus (i.e. Vicar) for Church Property, Fr. Mark Gnutel, also explained about the comprehensive assessment that has been mandated for every parish. A special team of experts has been put together and has already begun visiting every parish to study and evaluate the financial and stewardship practices. The goal is to pinpoint areas in need of improvement and to promote a best practices approach to the administering of each parish. Shortly after the morning session had begun the clergy received the news that the former head of the Ukrainian Catholic Church, His Beatitude Lubomyr Husar had died in Knyazhychi, Ukraine. All rose and commended him to the Lord in prayer and sang a heart-felt "Vichnaya Pamyat'" "Eternal Memory". They all warmly remembered his visit to Winnipeg while he still served as the Major Archbishop of their Church. In the end the clergy took advantage of the buffet offered by the hotel and spend a bit of time in fellowship before returning to their parishes.